Charges were filed today against former Philadelphia Highway Patrolman Jonathan Josey for punching a woman at the Puerto Rican Day festival in September. D.A. Seth Williams reviewed the video and saw that the situation was hectic, but use of force was not necessary. Josey is charged with simple assault. Jon Bon Jovi's 19 year old daughter, Stephanie Bongiovi, has been hospitalized. She was found in her dorm unresponsive after a heroin overdose. Bongiovi is attending Hamilton College in upstate New York. Investigators are also charging Stephanie Bongiovi and another student with possession of controlled substances. She is reportedly stable and recovering. In the Ligambi mob trial today, a subpoenaed Fox 29 undercover tape was played discussing a threat to kill Philadelphia disc jockey Jerry Blavat. In the video, Joe Ligambi is arguing with government witness Lou “Bent Finger” Monacello. Ligambi appears to blame “the Geator with the Heater” for a negative story about Ligambi in Philadelphia Magazine. FEMA has opened Disaster Centers in 19 New Jersey Counties battered by Superstorm Sandy. The Federal Emergency Management Agency approved more than $127 million in individual assistance in the past two weeks. To apply for assistance you can register on line at DisasterAssistance.gov or call 800-621-FEMA. Philadelphia Eagles coach Andy Reid said today that Michael Vick's concussion, which ended the quarterback's day against the Cowboys yesterday, was "pretty significant." Today Vick was complaining of headache and fatigue, so Reid told him to stay home. Backup Nick Foles will take snaps with the first team this week. The holiday classic, The Nutcracker Ballet is coming to the Meagher Theatre at Neumann University in Aston, PA. And iRadioPhilly is giving away free tickets! You can win a family pack of four tickets to one of the Nutcracker Ballet performances Friday, December 14th or Saturday, December 15th. To register, click the Nutcracker Ballet banner at iRadioPhilly.com or visit the contest page. A SEPTA bus collided with a car sending 10 people to the hospital today. The accident happened at 2nd and Olney about 8:15 this morning when the Route 18 bus hit a white sedan and another vehicle. Nine passengers on the bus and the driver were hurt. Three are in serious condition. 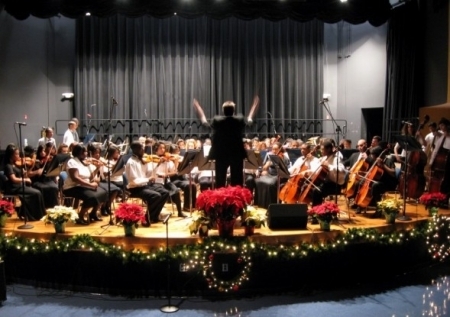 Philadelphia's GAMP, the Girard Academic Music Program, the elite public magnet school for gifted musicians, is losing its school busses. Part of school district cuts that would save the city a million dollars a year, officials at the school are concerned for the safety of students who would need to carry expensive instruments on SEPTA. The 500 student school educates fifth through 12th graders. Officials in Ocean County have confirmed the death of four people as a result of Superstorm Sandy. A 94 year old Forked River woman and a 71 year old Stafford man died from hyperthermia due to exposure to the cold. A 61 year old man from Brick and a 72 year old Little Egg Harbor man drowned. Today FEMA started bringing the first of several hundred pre-fab houses to parts of New Jersey and New York hardest hit by Sandy.